A thick fog has descended across several champion pages for one of the PC’s best free games. Seven characters are affected – but Riot aren’t telling what they’re affected by, or to what end. The champions now obscured by swirling stormclouds are Cassiopeia, Hecarim, LeBlanc, Lissandra, Twisted Fate, Xerath and Zed. 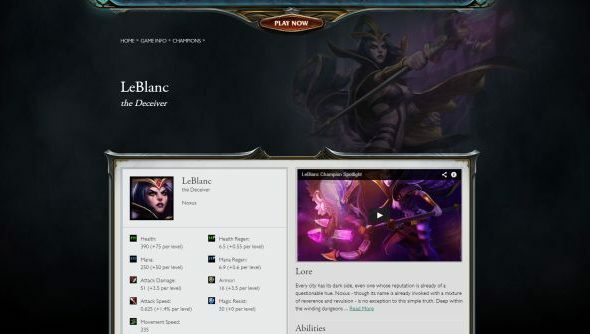 Visit any one of their pages and you’ll see their splash art swiftly covered by encroaching mists, punctuated by flashes of lightning. Community sleuths at Reign of Gaming have uncovered that the video files associated with the storm live in a folder named ‘video_teaser’. Champion pages have been defamed once before. Pink graffiti (which rechristened Vi as ‘Fat Hands’) heralded the arrival of manic 116th champion Jinx in the public test realm. Given all that, expect an imminent update to bring change of some sort to these seven champions – who include some of the most popular in LoL’s roster. Players are expecting comprehensive preseason changes to League of Legends’ jungle, and Riot recently named Cassiopeia as a champion in “clear need of attention”. Do you think that might have anything to do with this?